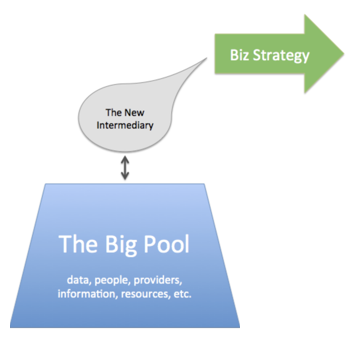 You’ve heard the term “disintermediation” – in common business language, it means removing the middleman. The excision of no-longer necessary “layers” in the business chain. Disintermediation shortens the distance betweens supplier and consumer. It disrupts the way business is done. Think about what Amazon has done to bookstores, or what AirBNB has done to the hotel industry. Many companies and people have lost work due to this internet-driven trend. But there are whole new business models on the other side of that coin – people and companies who can step in between two parties/needs and provide value. These are The New Intermediaries. And, for entrepreneurs, this is a model ripe with opportunity. A new intermediary provides value by creatively translating “stuff” into strategic business value, and/or by creating new connections that improve business. One of my Clarity clients specializes in creating intuitive visual design. Now, if you can look into a vast sea of poorly-structured information and create an information design presentation that advances business goals, you have added tremendous value as a specialized intermediary. How many of us have experienced corporate on-boarding that was slipshod and poorly structured/designed? A lot of people in their 30’s, 40’s, and 50’s who have built up a strong base of knowledge and credibility can create for themselves a nice niche as new intermediaries and role their own. The internet has created an explosion of “stuff,” but also there are tremendous opportunities that come with the enhanced ability to build and cultivate networks, and connect people to what/whom they need most. Digital networks are a powerful mechanism to enable business intermediation. My friend Kevin Kruse is an example of the new intermediation, through his site LeadX – an affordable, subscription-based portal for all things leadership training. This is a great example of content curation. In fact, I launched my Impactiviti business 12 years ago based on this concept, though I wasn’t really thinking so much about the generalized potential of the model. 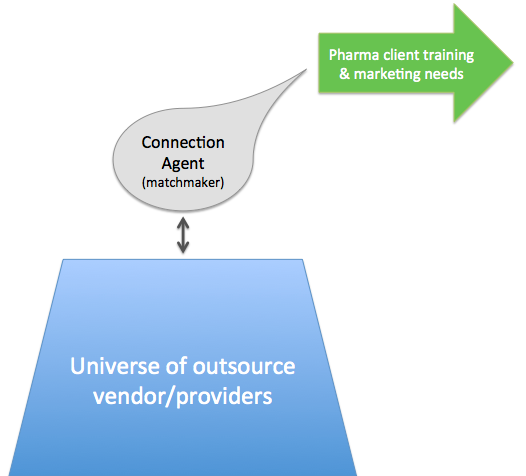 I create partnerships with the best outsource vendors for training and marketing development (out of a vast pool of providers), and then I “matchmake” my commercial pharma clients with the optimal providers – helping clients more efficiently choose vendors, while helping vendors more efficiently gain targeted business opportunities. George Weyrauch has built a similar model to help business connect with the marketing agencies and talent they need (Rock Creative Network). The intermediary has to have solid domain expertise and a trusted reputation to be effective. Only the top people and companies can do this. And isn’t that what we want – business growth opportunities for those who have earned differentiation through competence and trust? 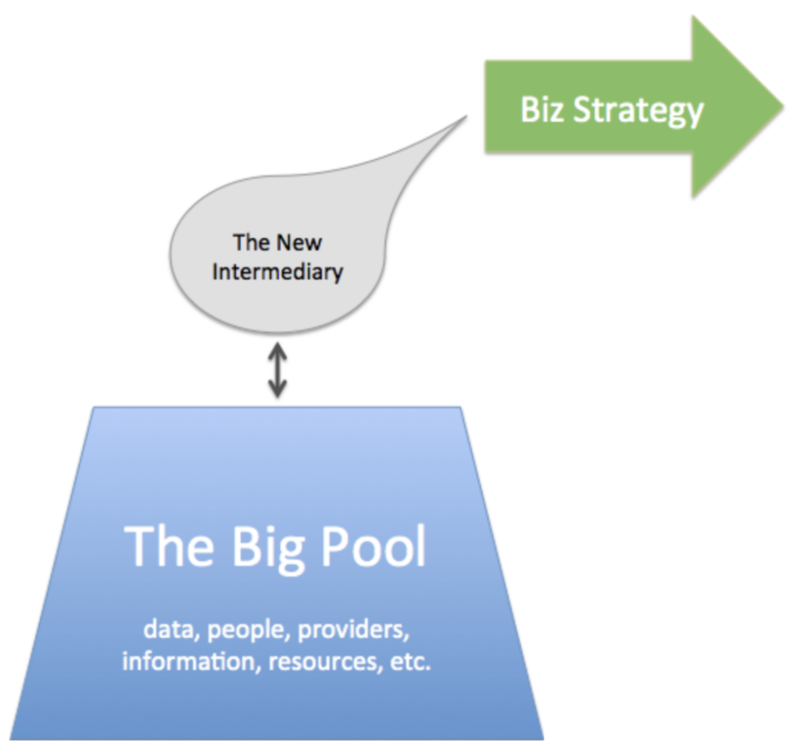 Entire new careers – and businesses – can be built on the practice of intermediation. Identify the gap, then add value by translating, creating efficiency, and making connections.